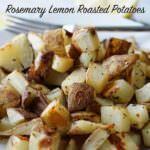 Rosemary Lemon Roasted Potatoes - roasting the potatoes enhances the flavor because of the caramelization and tastes 100 times better than frozen! Scrub and clean the potatoes thoroughly. Dice them into a one inch dice and place them in a plastic sealable bag. Preheat the oven to 400 degrees. Spray a baking sheet with non-stick coating. Place the potatoes on the sheet spreading into one even layer. Bake for 20 minutes, remove from oven and flip the potatoes. Return to the oven for another 10 minutes or until the potatoes are lightly brown and crispy. Serve immediately and enjoy!